"Great bike shop for mot's and servicing, staff always very helpful, been taking my bike since they opened always happy." "So after ringing about and being told I’d potentially be without my bike for 2 weeks, DMC came straight through with a solution and fixed my bike up within a day. Can’t recommend these guys enough, prices are fair, works professional and lads that work there are very professional anyone looking for a place for your pride and joy, this is the one to be at !" "I have used Doncaster Motorcycles for the past few years for servicing and MOTs, and I can honestly say that the quality of their work is excellent and I highly recommend them, if you value your bike these are the boys to look after it." "Fantastic service and a bucket full of free advice on another problem I had on a different bike...Put the dealership I bought the bike brand new from to shame." Welcome to Doncaster Motorcycles the specialists in Doncaster for Servicing, MOT's, Tyres and Repairs to all makes and model of motorcycle. At Doncaster Motorcycles we offer a personal service from a collection and delivery service, to allowing you to watch your bike being serviced or MOT’d so that you can see what we’re doing and anything that is being fitted. There’s a coffee machine and waiting area so if the job is not going to take too long, you may wish to wait for completion and ride home afterwards. 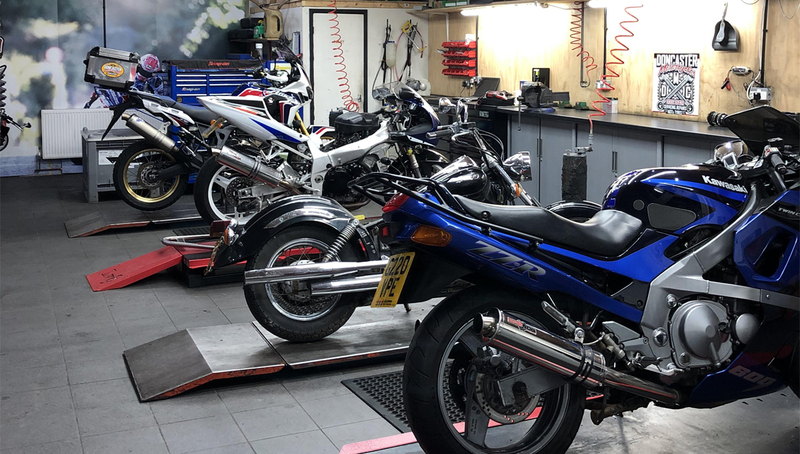 With a modern Tyre Fitting bay Doncaster Motorcycles have up to date tyre fitting equipment in their workshops and can supply any make of tyres in Doncaster, including Bridgestone, Avon, Pirelli, Michelin and Metzeler. If you require it Doncaster Motorcycles can provide a collection and delivery service for your motorcycle in a van that is fully equipped for motorcycle transportation. Book your MOT in Doncaster or your Service in Doncaster with Doncaster Motorcycles. If you are looking for affordable services with quick and efficient online booking 24/7 then we are the motorcycle garge for you. If you have any questions about the services that Doncaster Motorcycles offer please call us on 01302 364311 or complete our contact form.